Adults very small, wingless, dark brown to black, compressed laterally. Larve legless, worm-like, hairy Eggs laid on the host, Female may lay several hundred in her lifetime. Larve a scavenger feeding on debris in carpet or outdoors, including dried blood. 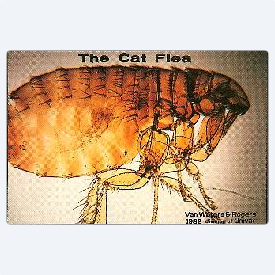 Extremely important vector of diseases, and cause of discomfort and allergies. 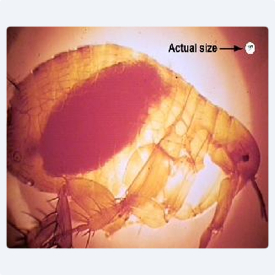 The oriental rat flea is small. 1/16th of an inch long, wingless, laterally flattened and has piercing-sucking mouthparts. It has very well-developed legs allowing it to jump at least six inches straight up.